Umewaka Minoru was a master performer in the Kanze school, famous for being one of “the Three Noh Masters of the Meiji Era”, together with Hōshō Kurō Tomoharu and Sakurama Banma. He was born in 1828 (Bunsei 11), and so was the oldest of these three. Minoru endured hard times when he was young, and this fostered courage, with which he managed to overcome those difficulties presented by the last days of the Shōgunate and the subsequent upheaval of the Meiji Restoration. He continued to give performances after the Meiji Restoration, when Noh actors had lost their means of living as a feudal lord’s retainer, and the Noh community itself was at a critical moment of its life. He contributed to establishing the foundation of the restoration of Noh art in the modern era. We should also note one of his great achievements, that of opening performances to a paying public, which opened the way to securing actors’ livelihood. The Umewaka family, originating from Yata Sarugaku in Tanba (north of Kyoto), acquired influence in the Noh community while in charge of the companion of Shite (Tsure) in the Kanze school during the Edo era (1603-1867), and became one of the distinguished families. They were allowed to perform the leading part in Shūgen-noh (small celebration pieces played at the end of the performance) or in Senzai (a part of a three-piece prelude of Okina: this drama is treated as a ritual and is rare, therefore it is always performed before all the other programs). Minoru was born in the Kujirai family which served the Ueno Kan'eiji Temple in Edo (currently Tokyo), and was adopted into the Umewaka family. It is said that, because his adoptive father liked luxury and was deeply in debt, he did not receive sufficient assistance for practice. Thus he learned Noh techniques the hard way: all by himself. The late Umewaka Rokurō, his son and the successor to the name of Minoru (the deceased), said that the young Minoru had a thin voice, but he practised repeatedly after being irked by a complaint that he sounded as though he were chanting in a covered bathtub. He had a hard time in the chaos that reigned from the last days of the Shōgunate to the beginning of the Meiji era, but he managed to build a small stage in his residence in Kuramae in 1865 (Keiō 1). He could not so much as install an entrance curtain, and so he once used a wrapping cloth for the curtain. At the time of the Meiji Restoration in 1868, he was forty-one years of age. There was a trend for people to demean arts such as Noh, but he improved his technique continuously and stayed on his own small stage. After he gave an excellent performance in "Okina" in 1871 (Meiji 4), his supporters increased gradually. He also upgraded his own performing environment by relocating a stage from a theatre owned by a distinguished family. His fame as an unrivalled actor gradually spread amongst the cognoscenti. In 1876 (Meiji 9), Minoru supported the appearance of Hōshō Kurō Tomoharu XVI in a performance before the Meiji Emperor at the residence of an influential politician, Iwakura Tomomi. It was a chance for him to become active in the Noh community again. Although they were of different schools, Kurō Tomoharu and Minoru were on close terms. They appeared on stage together, and sometimes one chanted and the other performed, and vice versa. They were also good at dual performances. 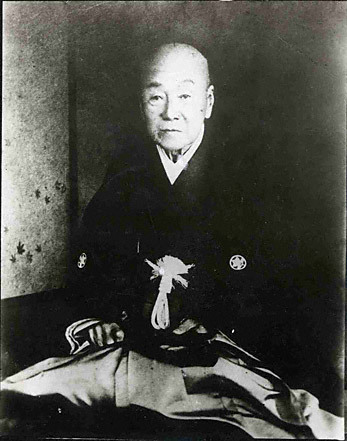 Hōshō Kurō Tomoharu once recalled the work of Umewaka Minoru, and praised him saying "Minoru was a great actor because he never gave up Noh, enduring many hardships in the days when there were no other actors trying to continue, and people would throw stones when they heard Noh chanting." Minoru performed before the Emperor many times, and established his indisputable fame in the latter half of his life. Indeed is accurate to say that these days proved the most artistically fruitful of his life. Ernest Francisco Fenollosa (1853-1908), an American philosopher who came to Japan in the Meiji era, introduced many kinds of Japanese art to foreign lands. He was fascinated by Noh plays and even studied it under Minoru. It was a significant opportunity for the art of Noh to be successfully introduced to foreign countries. In 1905 (Meiji 38), he performed "Shakkyō," which was the last performance for him as a formal Noh play. He died at over 80 years of age, in 1909 (Meiji 42).